Universities are a place for big ideas. They’re where people push boundaries, make discoveries and expand human understanding of the world and their place in it. At UofL, big ideas don’t stay in the classroom or lab. Rather, they grow — into new research-backed technologies; into companies led by faculty, staff, students and alumni; and into innovative collaborations with outside organizations. Many big ideas are generated through research. UofL ranks as one of only 120 U.S. “Research 1” universities with “very high research activity,” according to the Carnegie Classification of Institutions of Higher Education. That research activity has spawned technologies for a variety of fields, ranging from materials to medicine. Take, for example, the can-cer-targeting nanoparticle technology, dubbed “ALAN,” now licensed to California biotech company Qualigen Inc. Even outside of research, UofL students, faculty, staff and alumni are chock-full of big ideas. 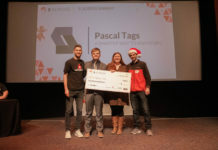 Consider Pascal Tags, a startup founded by a recent grad and a current student, who invented the technology with a faculty adviser. Or Appriss Inc., an international victim notifica-tion company founded and led by Cardinal alums. Other big ideas come from collaborations with off-campus partners. UofL often works with industry on projects or even on full-fledged innovation centers, like those opened by Kindred Healthcare Inc. and GE Appliances, a Haier company. The latter’s FirstBuild makerspace and microfactory, on the Belknap Campus, gives students a chance to further develop the skills they learn in the classroom by working on projects and developing new products. Meanwhile, the company benefits from students’ fresh perspectives. “Our goal at UofL is to get those ideas from mind to market,” said Allen Morris, director of UofL’s Commercial-ization EPI-Center, which helps protect UofL inventions and ﬁnd commercial partners. California-based medical device company Qualigen Inc. has licensed a drug technology developed at UofL that uses tiny, DNA-coated gold nanoparticles to target cancer. Paula Bates, a professor of medicine, worked with a team of researchers from the School of Medicine and J.B. Speed School of Engineering to develop the technology, dubbed “ALAN” (for Aptamer-Linked Au Nanoparticles). “The key is that the ALAN technology can kill cancer cells but not normal cells,” Bates said. Many currently available treatments may also harm healthy, non-cancerous tissue. The ALAN aptamer itself has been previously tested in more than 100 patients and has had no evidence of severe side effects. At least seven of those patients either saw their cancers disappear or shrink substantially. In the new ALAN technology, the aptamer — a short, single-stranded piece of DNA — is attached to gold, which should make it more durable and active than the original formulation. The new ALAN formulation is expected to enter clinical trials by 2020. The team worked with the UofL Commercialization EPI-Center to protect and commercialize their intellectual property. Qualigen also has a sponsored research agreement with UofL for further development. For J.B. Speed School of Engineering student Brandon Young, it all started with a weekend business pitch competition. Today, he’s at the helm of Pascal Tags, an up-and-coming startup with a smart tracking technology he helped invent. Pascal Tags was founded by Young and College of Business graduate Haley Pfeiffer ’18. 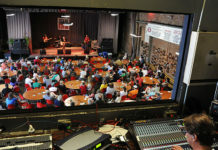 After they won Startup Weekend, a whirlwind two-day competition, they decided to make a real go of it. “Making a company, being able to push and compete against start-ups that have been around for years is something that’s just been mind-blowing for me,” Young said. meant to help companies track inventory. 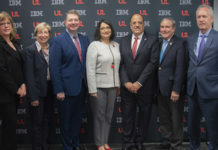 The team worked closely with UofL’s Commercialization EPI-Center and also used UofL entrepreneurship training and translational research programs. Since that first competition, Pascal has been busy racking up honors, including a Vogt Award, reaching the finals in the Collegiate Inventors Challenge and taking first in the 5 Across statewide pitch competition. Mike Davis ’84 and Yung Nguyen ’86, ’88, ’90 founded Appriss Inc. in 1993, in response to local news reports about Mary Byron, a young woman murdered by her ex-boyfriend after he was released from jail. Appriss Inc. co-founders and UofL alums Mike Davis and Yung Nguyen at the company’s Louisville headquarters. “Mike and I thought we could develop an automated victim notification system that could address that issue,” Nguyen said. Davis, who studied computer science/data processing, and Nguyen, who studied computer engineering and mathematics put their education to work and invented VINE, a platform that notifies victims when their offenders are released from jail. “Everything I learned about computers at that time, I learned from Speed School,” Nguyen said. They formed their own company, working in Nguyen’s basement after their normal workday. They eventually went full time, and today have grown Appriss into a data company with corporate headquarters in Louisville and offices on two continents. FirstBuild makerspace and microfactory is often a whir of activity. Makers use 3D printers, laser cutters and other tools to bring their ideas to life or to work on new innovations for GE Appliances. The space is the birthplace of new products such as the Paragon induction cooker and the popular Opal Ice Nugget Maker. “Our products that are manufactured here at FirstBuild have actually been made by University of Louisville students,” said its director, Larry Portaro. Because the center is on Belknap Campus, students can gain experience through intern-ships and by visiting for classes or to work on their own projects. Meanwhile, having students at FirstBuild brings “a tremendous amount of passion and creativity,” Portaro said. When the center opened in 2014, the idea was to reduce the cost and time needed to develop new products — and validate market demand ahead of time — through a combination of crowd-funding, open innovation and hands-on collaboration with students and other makers.